I have decided to concentrate on just one variety of elves, so the Wood Elves are looking for a new home. Click here to go straight to ebay. It's a decent sized starter army, fully painted and with converted figures and classic metals throughout. A great way to get gaming with the new book, before adding any of the new toys. Tell all your friends! The complete army contains a spellweaver, a branchwraith, 20 glade guard, 18 dryads, 12 wardancers, 5 waywatchers/scout, 6 treekin and a mighty treeman. The second regiment for the new elf army is now prepped and sandy based, ready for some primer. These are truly beautiful minis. I am not one of those collectors who will only collect metal figures from a certain era, rather I choose whatever is best in my eyes and affordable to my wallet. A lot of the time this means me collecting modern sculpts in plastic - my chaos and vampire armies are both very much in this category. 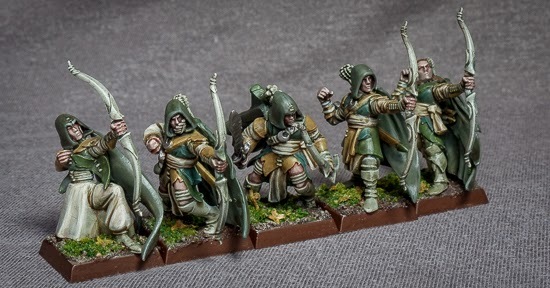 In the case of the elf army, I just happened to notice these figures on sale on a forum and bought them on a whim, but I am really struck by how nice they are now that they are stripped, prepped and ranked up like this. While I like some of the elf plastics, I cannot deny that they may have peaked back in the late 1990's. 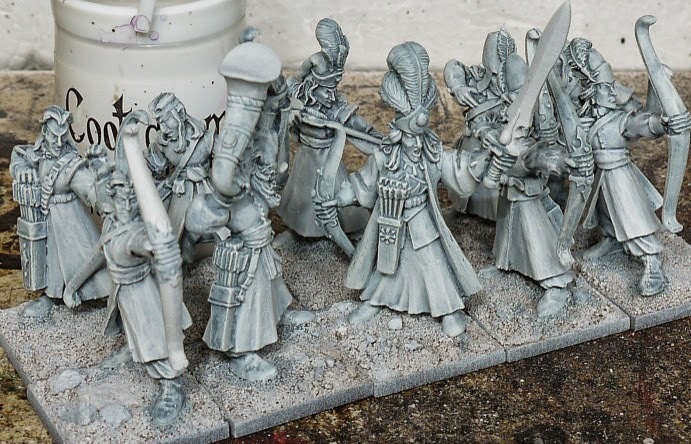 Of course, that's just my opinion and I would be very happy to include some new plastics in the army, including the excellent Sea Guard from the Island of Blood set. In the background you can see that I am making decent progress on the archers. You can just about make out the palette in blurred form, which gives a flavour of the scheme I am aiming for. I will continue the theme on to the Sea Guard, but with some variation. 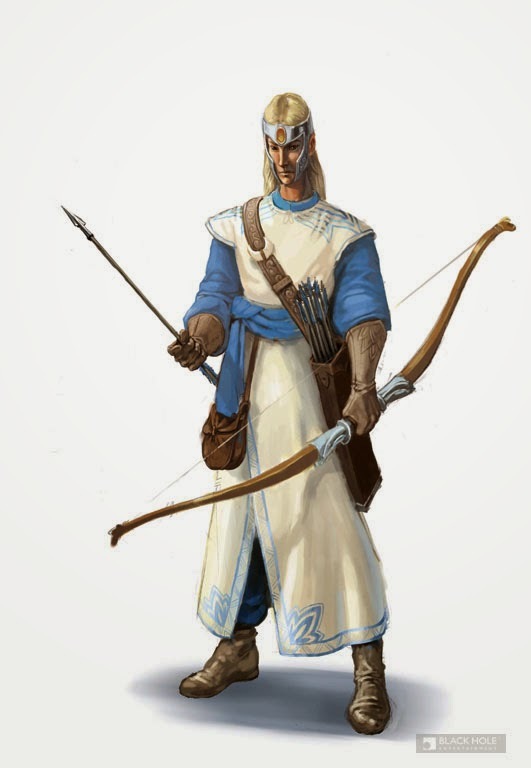 In my mind the archers are from Yvresse or Cothique, while the Sea Guard are obviously from Lothern, so regional differences in costume is only to be expected. I also have an idea for the banner and shields, just praying I can pull it off. Many painters struggle with painting white, I know I did for many years. The traditional method is to start with grey or blue and layer up from there, adding more and more white to your highlight colour. It works, but it's not easy to do and it takes a long time. I reckon much of the problem stems from the old system of priming black and working up from there. 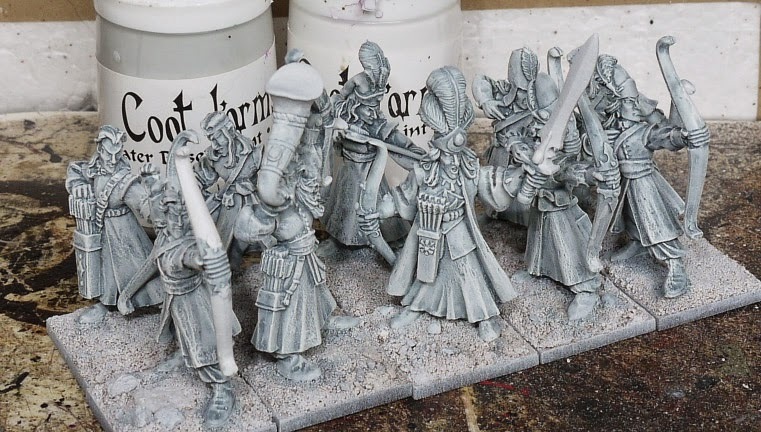 If you start with the white, then shade, then re-highlight, it's much easier, much quicker and thus highly suited to painting an army. Here's the recipe I have settled on for my relaunched elf army. As you read through the guide, click to enlarge the images. White is a subtle colour and you need to view the pictures at full size to understand the text. First I primed the unit with a white spray primer. I used Halfords car primer, available in the UK, there must be similar around the world. Any bits I missed got a little splodge of brush on white surface primer by Vallejo. When the white primer was dry, I glazed thinly over the whole model with this dark grey colour. I am aiming for a cool, clean white. If you wanted a warmer, creamy white you would use a mid brown or tan at this stage. Once the shade colour is fully dry, it's time to bring the white back. I simply drybrushed these models, first with a light grey, then with a white. Now I realise that many will be shocked here, surely drybrushing is what you do when you are a complete beginner before you progress on to layering and other "proper" techniques? Maybe that's true for some, for me it's a question of using the tools and techniques at my disposal. Drybrushing is quick and easy and really picks out the raised areas that require highlighting, especially on these old metal figures, though I suspect the new plastics would yield just as good results. Yes, the finish is chalky, but that will be fixed in the next step. The final step is a glaze. This removes the chalkiness of the drybrushing and really whitens the white. I applied a white glaze over all the model to remove most of the chalky effect. When that was dry, I added a more specific glaze highlight, on just the raised areas, or the areas that were extra chalky and messy. It gives a nice, smooth highlight and really does not take much time. In fact, the whole unit of 10 archers I primed and got to this stage in about 2 hours, which for me is a good, fast result. There's still a long way to go on this unit, but the tricky white robes are now done. The white primer and wash will serve me in other ways too. It acts as a guide for where the light and shade is. It also acts as an under colour for some of the details. I should be able to complete many other areas with a thin base coat and a glaze or two. I never thought I would be able to speed paint elves, with all the details they have, but this is a promising start. 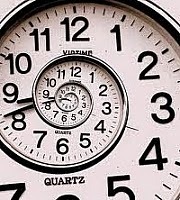 A trio of recent events have reminded me that time plods slowly onward, there's no escaping the relentless dropping of the sand grains in the hour glass of life. No, it's not my birthday, that's next month. It was a strange combination of things that all happened within a few days of each other, scientific proof if ever it was needed that things really do happen in threes. The first event was an email from CoolMini. 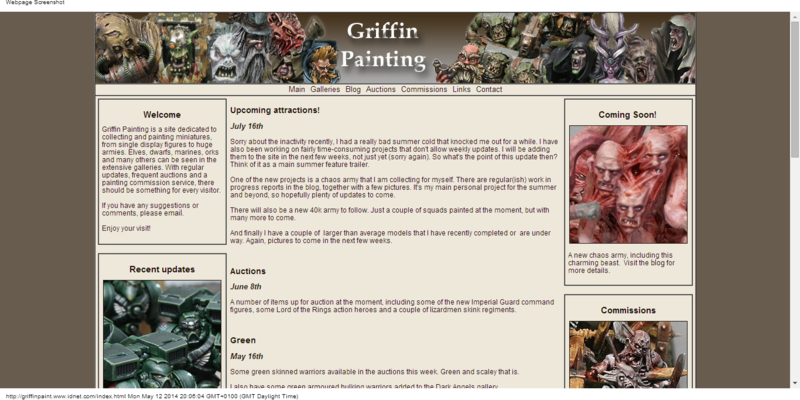 I posted a good number of images on the site years ago, when I first started my painting service. It was a good way to publicise my work and I enjoyed the challenge of getting a good rating for my painting. I don't post there now, I find that the grades are more of a disincentive than anything. Anyway, that's a bit of waffle, the point was that it's been such a long time since I have had any comments on my work there, so naturally I followed the link to see what had happened. 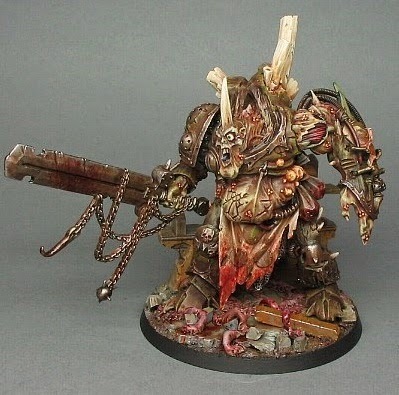 Somebody had left a comment on the Daemon Prince of Nurgle. Nothing amazing about that you might think, comments are left all the time. Well here's a link to go see the actual page, see if you can spot the weird event - there's a big clue in the preamble, no prizes if you get it! Did you spot it? Check out the comments. There's about a dozen left over a two week period, at the time I posted the picture. Then a single new comment. Here's the shocker - the image was posted in July 2006 and a comment pops up eight years later. That's longer than I have been writing this blog, and represents over a third of the time I spent in the hobby. Spooky event number one. Incidentally, if you look through my images on CoolMini you will see that the big guy scored a respectable 9 out of 10, a feat I managed only three times in the 100+ times I posted. Well done big guy. The second weird event came courtesy of ebay. I was browsing the wargaming section, looking for bargains as I often do. Up flashed an image that I recognised from years gone by. These zombies were part of an undead army I had built and painted back in, well, I can't even remember when it was. I am pretty sure it was well over 10 years ago, probably even longer than that. It featured in a rather dubious advert for a movement tray - yes the item for sale was actually the spectacularly ordinary tray barely visible under those shuffling, rotting corpses. I guess they thought that zombies are ever popular and it would prove a good way to attract attention. Well, I certainly spotted it. The zombies are long gone, they were part of a Necrarch themed Vampire Counts army that I used in many a tournament before finally selling it to a gamer from across the ocean. I am pretty sure I stopped attending tournaments pre-2000, so that gives another clue as to how old it is. The third and final strange event was my stumbling across my old website. It's not my first website by any means, but it is several years old, from the free webspace that was available with my old web provider. When I switched to broadband I was no longer able to access the old site and I assumed it would just disappear eventually. But no, it's still there, a good five years or so since I last updated it. If for some strange reason you want to have a look at it, here's a link. Maybe old websites never die, they just float around in the vastness of the internet, lost like a single star in the immenseness of the universe. Or maybe somebody just forgot to remove my free web space. Who knows? Cue Twilight Zone theme tune. I am suddenly feeling a bit elvish. The wood elves have been in the news recently of course, but it's the High Elves of Ulthuan that are on my mind. A recent trip to the coast had me thinking about the beautiful colours of a coastal palette and I wondered if I should perhaps revisit the oldest of my armies. High elves were probably the thing that drew me into the Warhammer world, back in the mid 1990's. The fourth edition boxset containing elves and goblins was my first experience of the battle game and I think the High Elf army book was the first I ever bought (though it might have been the Undead, it's a long time ago). 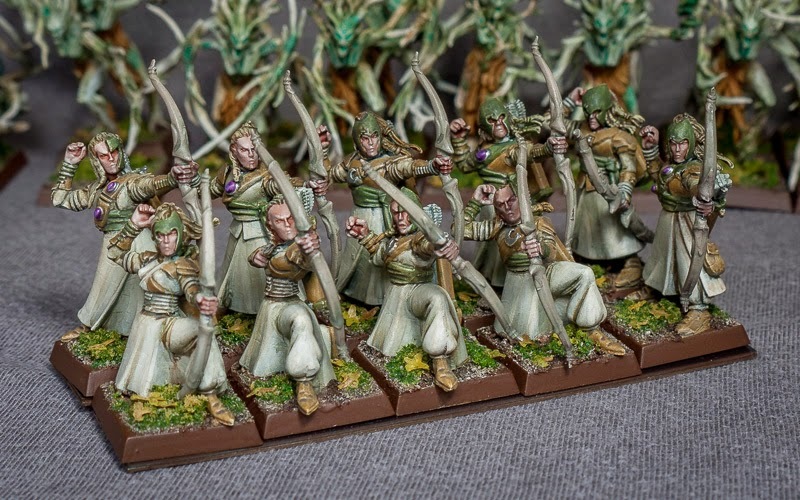 I wanted to collect an elf army more than any other, but they were difficult to paint for a beginner and I put them aside for a couple of years until I had gained more experience. Then I slowly painted up my plastics from that first boxset, plus a good number of metals. I still have that army in my glass cabinet, it's the oldest surviving part of my collection, it feels like a significant part of my wargaming history (if playing toy soliders can ever be considered as significant). I played them for many years, I still have the first four versions of the High Elf army books. The models have always struck me as among the best in the fantasy range and I love the background too. I dabbled with a new elf army a few years ago, but it was more a diversion than a real project. I am increasingly feeling the need to bring my collection up to date. I still have a large number of Silver Helms from the 1990's, but I am pondering the possibility of using alternative steeds. 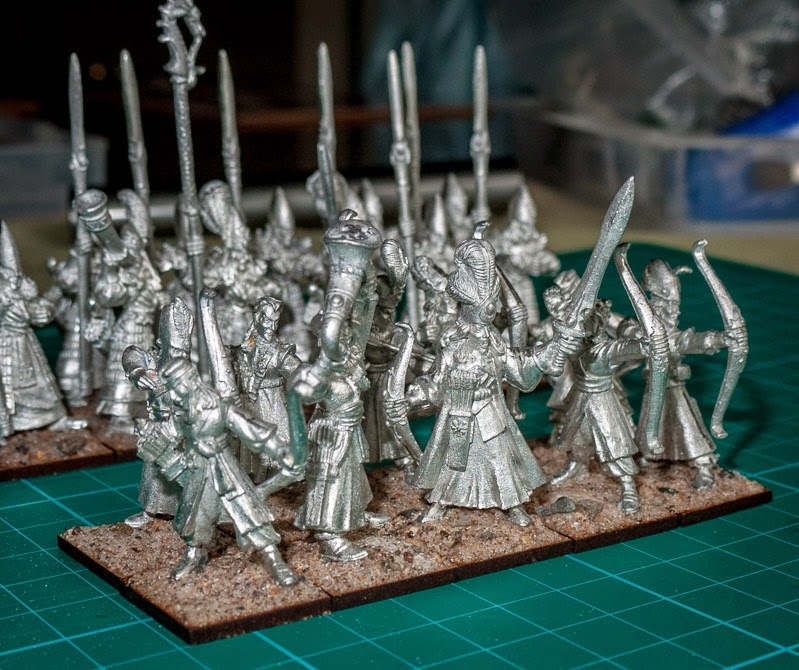 In the meanwhile, I have been prepping and basing these lovely old metal figures. I am not usually a member of the metal-is-better fan club, but I do love these old sculpts and feel they have the edge over the plastics. 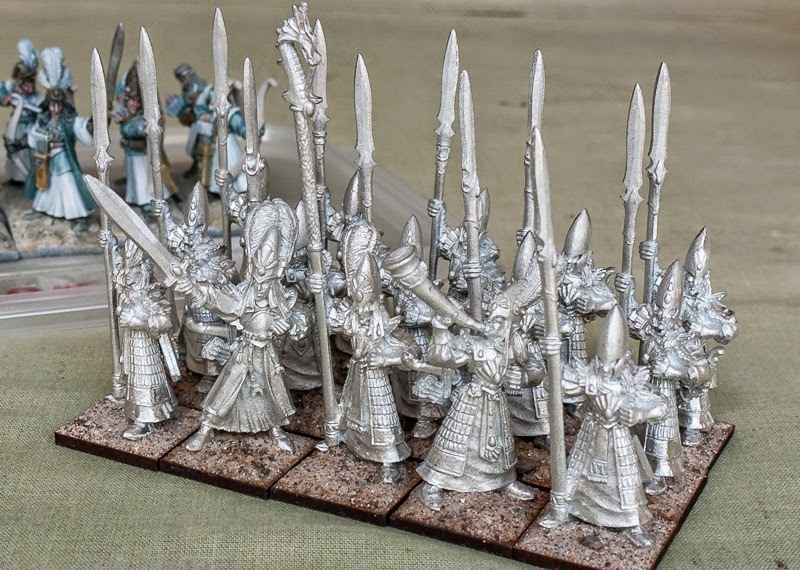 I was lucky enough to spot these for sale on a forum and snapped them up, though I would be quite happy to use the plastic archers too, with head swaps. The bases are mdf squares, there's something about butting them up to each other with no gaps that appeals to the OCD in me. They should be easy to magnetise too, so I will be building magnetic movement trays of some form. One of the things I am most looking forward to is putting my own stamp on the army. As a beginner I was very happy to copy the official colours back in the 1990's, but these days I am far more confident in devising my own palette. Shield and banner designs are always a stumbling block for me, so I have started to collect inspirational ideas like this one. 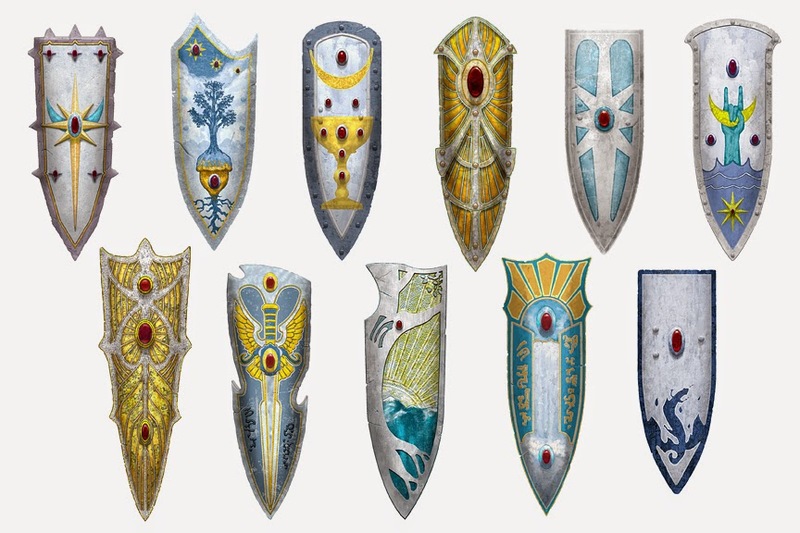 There's no way I could paint these, but I might have a bash at customising my own shield transfers. They won't be needed until I paint the Lothern Sea Guard and the Silver Helms, the archers as a first regiment will help me to nail down the colours of the robes, metals and the flesh. The theme I have in mind was inspired by a trip to the coast. At first I was thinking about an army based on the kingdom of Yvresse, but expanded it to include the eastern section of the whole continent, to allow me to include more troop types. I will be able to finally paint up the oldest figures in my collection, repaint some I have used myriad times, and add some of the newer plastics too. Like all my armies, it won't be completed quickly, it will take years. 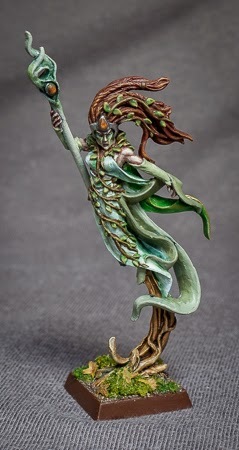 I have always found that I make better progress when I follow the muse, she currently calls me to the coastline of Ulthuan, and answer her I will. 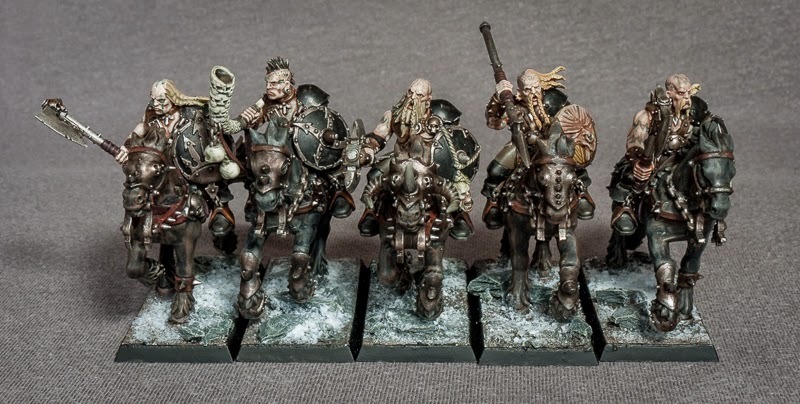 This unit of marauder horsemen has been a long time coming. They were a xmas present to myself when the chaos book was updated last version but one, so 2008. I assembled them straight away, but then distractions struck and they were put to one side - for nearly six years! I'm embarrassed to say that a unit of knights and a character bought at the same time is still only partly assembled. For the colours I stuck with the black armour of the majority of my chaos army. The light flesh tones and blonde hair help to lift the unit a little. There's tattoos on the skin of the riders, but it's hard to pick up on these photos. I must try to get a game with these guys after such along wait, I have not played Warhammer for such a long time and really fancy a game or three.